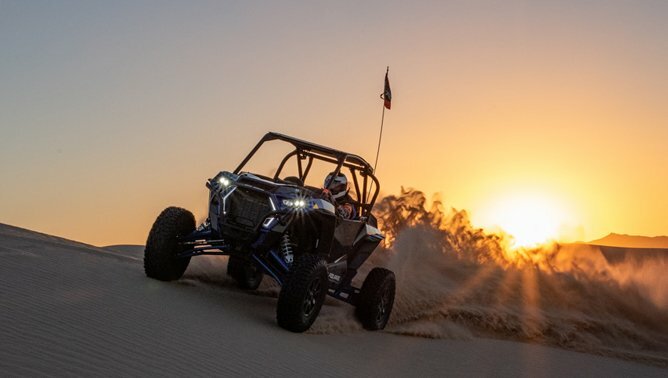 In the world of ultra high-performance Turbo UTVs, the Polaris RZR lineup has always enjoyed success as one of the most capable machines on the market. 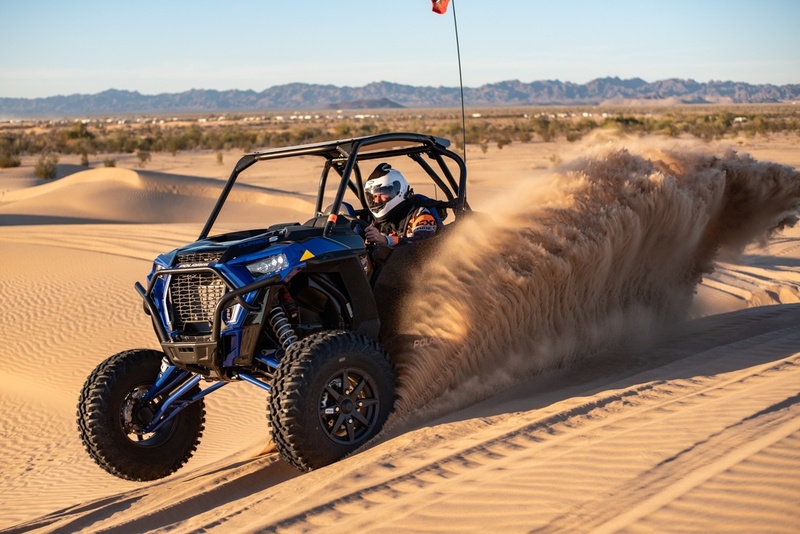 With technologies like Dynamix active suspension combined with a driver-centric cabin and a 168-horsepower engine, the RZR Turbo lineup has evolved over time to be one of the best driving vehicles on the market. 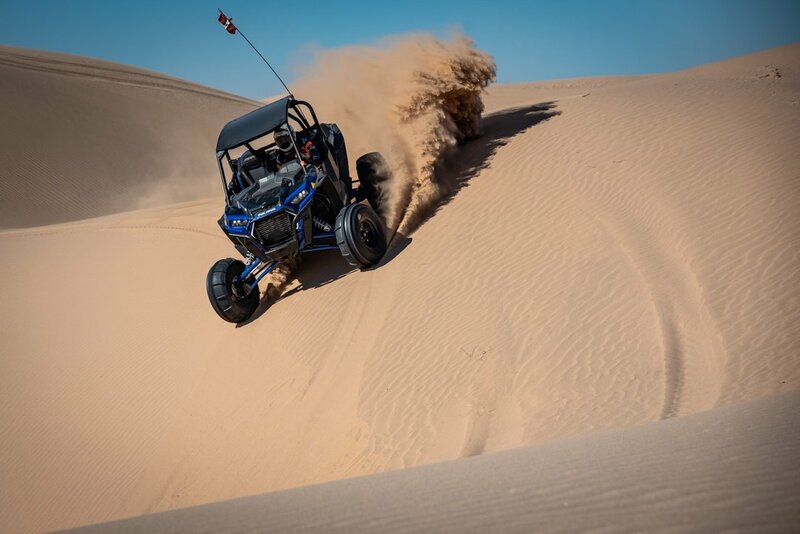 However, even the original model in the marketplace can’t stay complacent, especially with new competition coming in the form of the Maverick X3 from Can-Am. 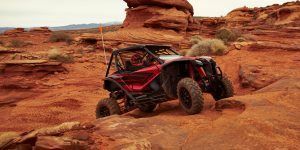 By now, you all know that the X3 is no slouch and beat the RZR in almost every category as of the 2018 model year. But Polaris isn’t one to rest on their laurels before coming out with a revised or new vehicle to take on even the heartiest of challengers. 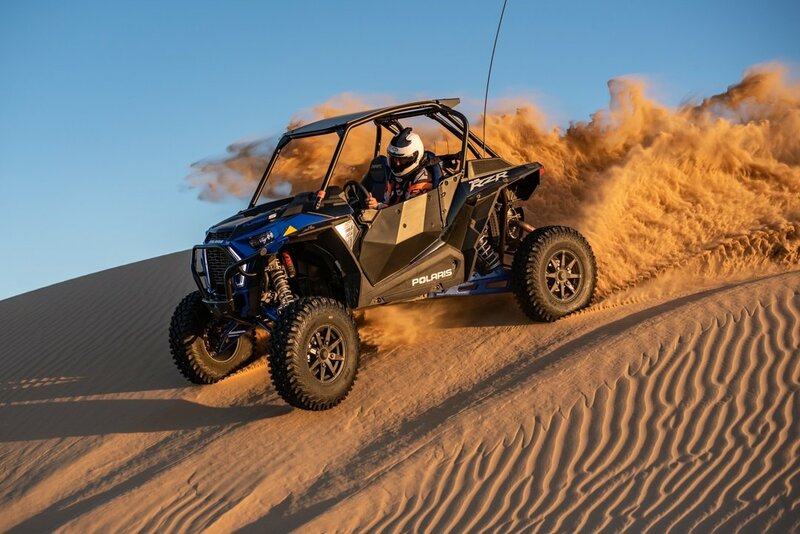 So, for the late 2018 and 2019 model year, we were graced with the all-new RZR XP Turbo S – a 72” wide machine that is a heavily revised version of the RZR platform from the ground up. ALSO SEE: Honda Talon vs the Rest: How Does It Stack Up to Polaris, Textron, Yamaha and Can-Am? 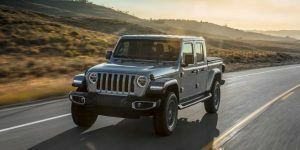 While the only visual cues giving away the updates are that menacing LED-lit front grille and the updated rear tail light fascia, the majority of the changes lie underneath the skin of this beast. The frame has been strengthened for the added stress that this 72” wide machine can endure. Even the outer flanks of the frame, such as the a-arm front suspension components and the trailing arms in the rear, were strengthened with larger diameter tubing and more bracing all around. The rear radius rod links are larger and the front arms have, by far, the largest diameter steel tube ever put on an RZR. In addition, bracing was added to the interior portions of the chassis to ensure that all the parts were made to endure the harsh desert terrain. In addition to the driveline strengthening, the interior of the Turbo S was revised with a better looking and more functional dashboard. Now the driver has a dedicated instrument cluster, a la General, that gives you a bird’s eye view of the machine’s vitals right in front of you. The driver no longer has to look at the center of the dash to see how fast they are going or how the temperature of the machine is fairing. Personally, for my 6’3”, long-torso body, I found that a comfortable position for the adjustable steering wheel blocked a direct view of the instrument cluster. So, while I like the fact that there is one there, I don’t like how I can’t see it clearly when driving – consequently, I have to duck my head to view the cluster clearly. Minor details, yes, but when you’re looking to view the dash easily then you’ll notice these little things. The good news is that the 7” Ride Command system, which comes standard on this Turbo S, is as easy to see as ever. I am consistently surprised with how well this massive center screen is viewed from any angle, in any light. Glove-touch capability is welcomed, and all the buttons are within easy reach. The latest edition of this Ride Command system has a new interface that looks more modern and is extremely easy to operate. 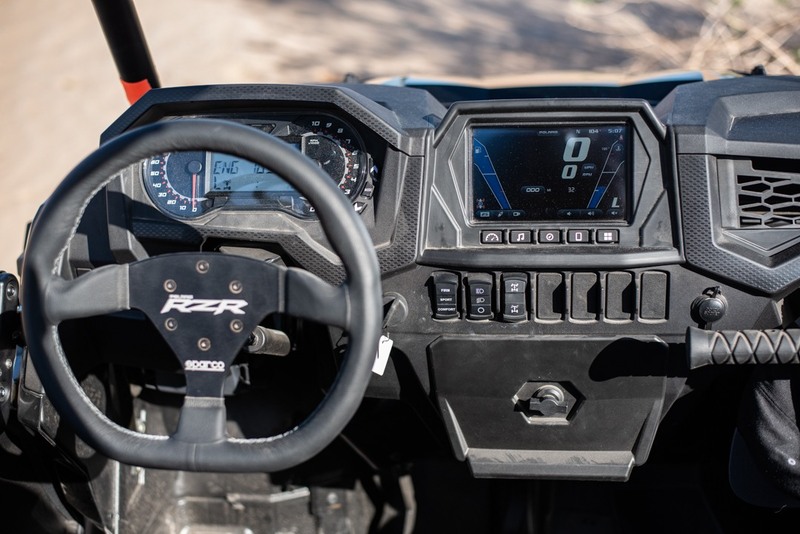 Kudos, Polaris, for putting together a navigation system in an off-road vehicle that does so much more than just help you navigate the trails. Yes, the dash is all new and there is plenty of storage in here, although still not quite as much as you would find in an X3. The glove box is large, though, and there is a lot of storage possibilities for the rear cargo bed. You can get soft pouches, hard storage containers, and many more items for the cargo bed from the aftermarket. What you can also get from the aftermarket is a good set of interior seats. Yes, these RZR seats are getting old in the tooth at this point, mainly because the other manufacturers have passed up RZR when it comes to seating comfort. 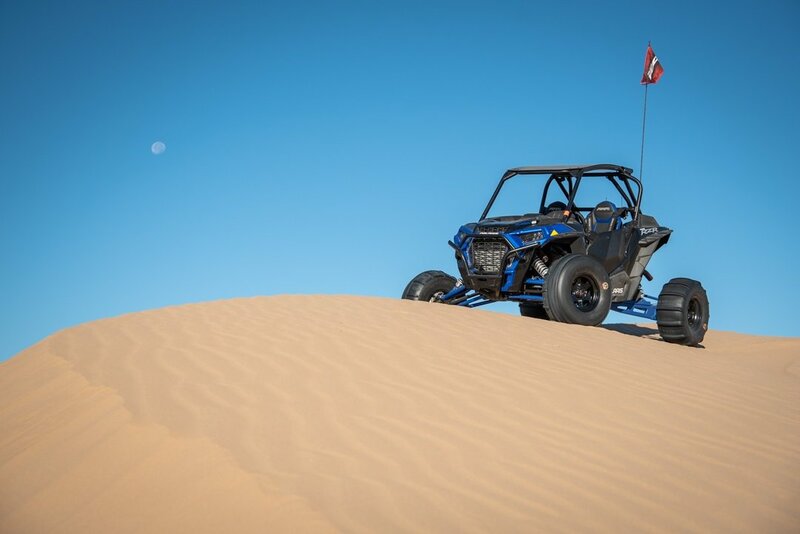 If I’m going to spend over $28k on an off-road toy, I’d like it to have better stock seats (stiffer seat frames and bases, along with longer bottom seat cushions and more side bolstering, please) with seat sliders that don’t get jammed up after a couple uses! 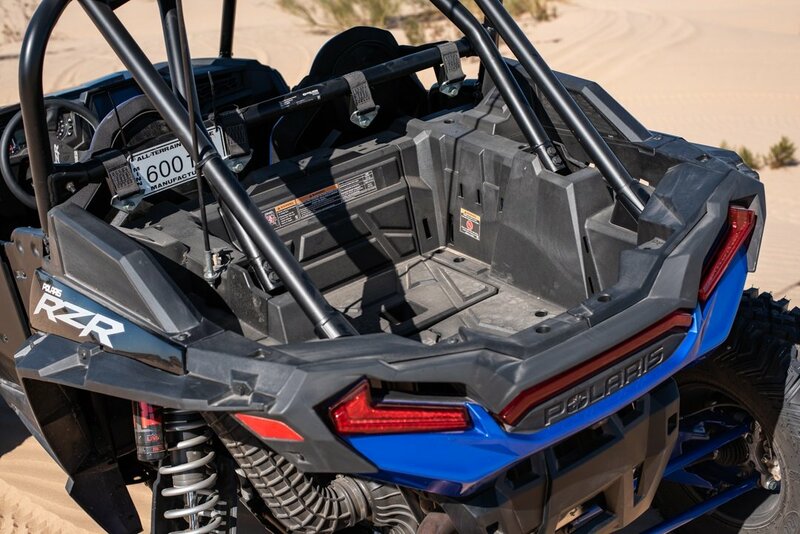 With all that being said, I am VERY excited that Polaris included 4-point harnesses on this vehicle from the factory (something that every Turbo machine should include). Polaris finally allowed Fox to do some real-world tuning to these shocks. The biggest problem with the non-S-model Dynamix shocks is that they are still sprung too stiff with essentially a single rate spring setup (yes, there are two springs there but the usefulness of the primary spring is nill when you look at the sum of the suspension travel. Hence the reason the back end still resembles a bucking bronco in the rough stuff). The Turbo S has a primary spring that is actually there to smooth the ride out and take away the small to medium sized bumps, and when you combine that plushness with the Comfort shock setting, you have a vehicle that smooths out the little chop in the desert and sand with ease. The Turbo S actually has a nice ride to it, and that’s something you couldn’t say about the stock 64” Dynamix models. Flick the switch up to Sport and then you really get something special here. Combined with the 72” wide stance and the Sport-tuned shocks, this Dynamix system really shines in a variety of terrain. I threw it corners – the vehicle stayed flat (front and rear sway bars help this as well). I jumped it to a flat landing – it soaked up the landing with a plush comfort that didn’t rebound obnoxiously whatsoever. I transitioned over the steepest bowls and the Turbo S was extremely predictable on the sharpest of razorbacks. And, it actually soaked up the whoops with ease (still not as good as an X3 X rs though…). In other words, the Sport setting is the money setting for almost any situation. Firm, however, is only needed when you are coming up to a steep transition in the dunes or when you’re rock crawling. 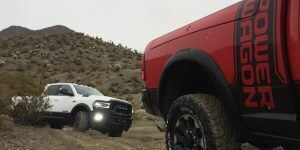 The latter of those terrains benefits from the Firm setting by essentially raising the vehicle for more ground clearance. Firm also works in the dune transitions because it soaks them up with ease and prevents bottoming out. Why so much talk about the suspension and wider stance, you ask?! Because those two areas are what really makes this Turbo S special. 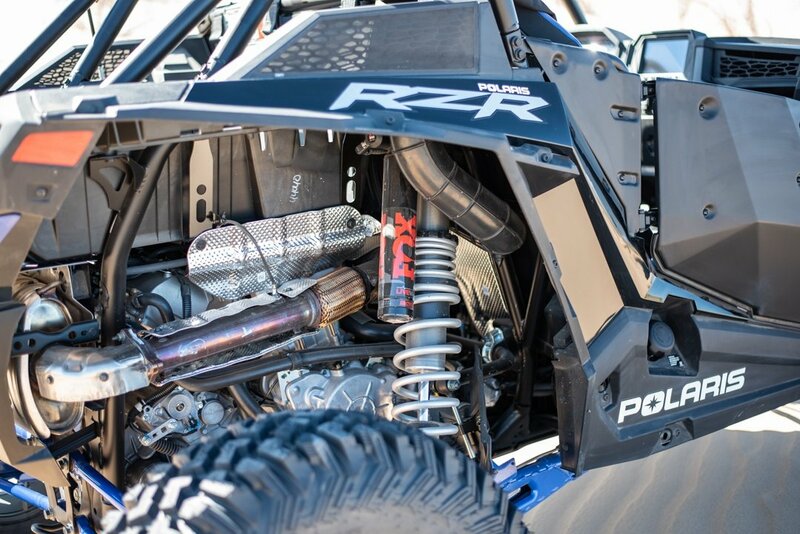 The 168 horsepower mill is standard for top-of-the-line RZRs these days. 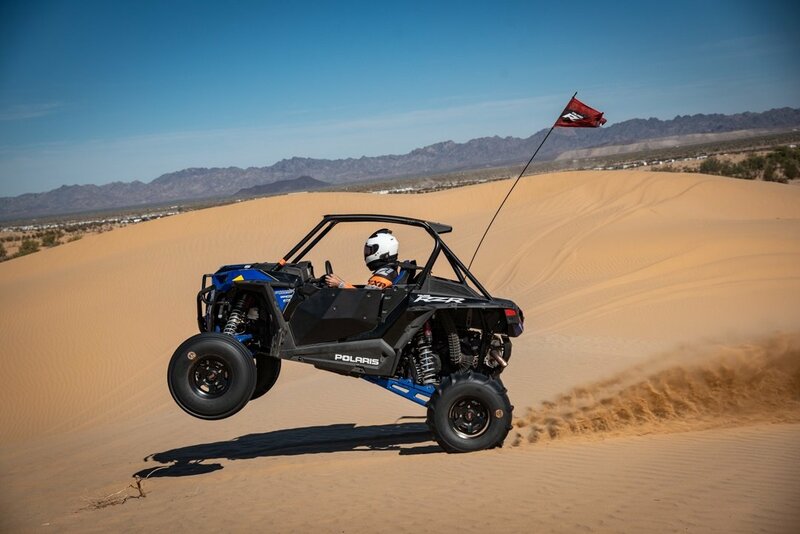 Yes, there is no doubt this UTV has plenty of power to take on any sand dune you want, especially if you bolt on a set of paddle tires to this machine. We did just that and found that the vehicle’s stability and predictable driving nature was only enhanced, especially with this GMZ front and rear paddle set. The stock 32” ITP tires are not the best in the sand, especially with their flat top profile. While we could still get everywhere we wanted, these tires don’t perform as well as Bighorns in the soft stuff, mainly because they don’t have as much traction and aren’t as predictable in the corners. Your money will be well spent on paddles if you want to drive the Turbo S in the sand. The interior is the final point that we really enjoyed the Turbo S’s enhancements this year. The clean dash layout is by far better than previous generations. 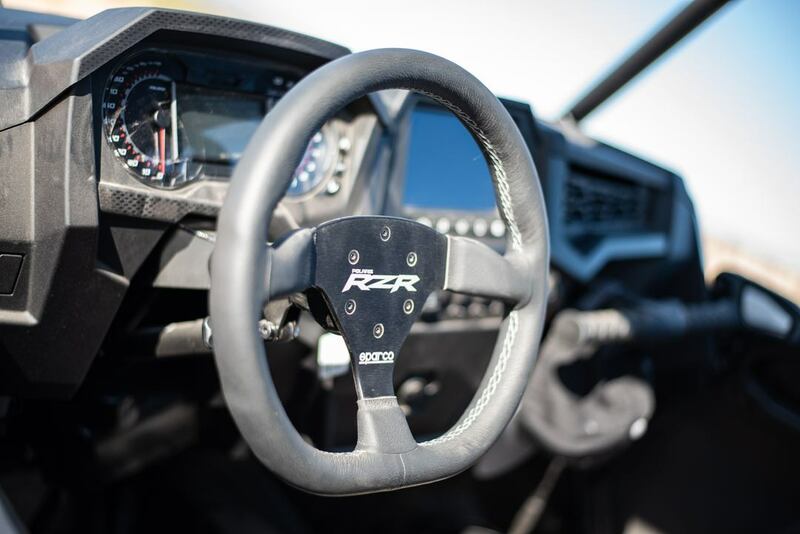 With those visual enhancements comes better fit and finish, and the RZR finally has virtually no rattles or squeaks on the inside. Put simply, the Turbo S is a pleasure to drive – fast, slow, turtle speed, whatever you want. This can also be said for the drivetrain as we experienced smooth and quiet drivetrain, free of rattles. You couldn’t say that about previous generations of the RZR. Plus, that new front differential is confident and very well sorted with smooth engagement, just like it should be. Back to the original question for a minute – is this Turbo S the new king of the sport UTV class? In all reality, and you should expect this answer, the answer depends on your personal preference. If you want a slightly higher seating position, more electronics built in, then you’re going to go with the Turbo S over the X3. If you want a lower seating position, more suspension travel (don’t let the Polaris “usable travel” numbers fool you! 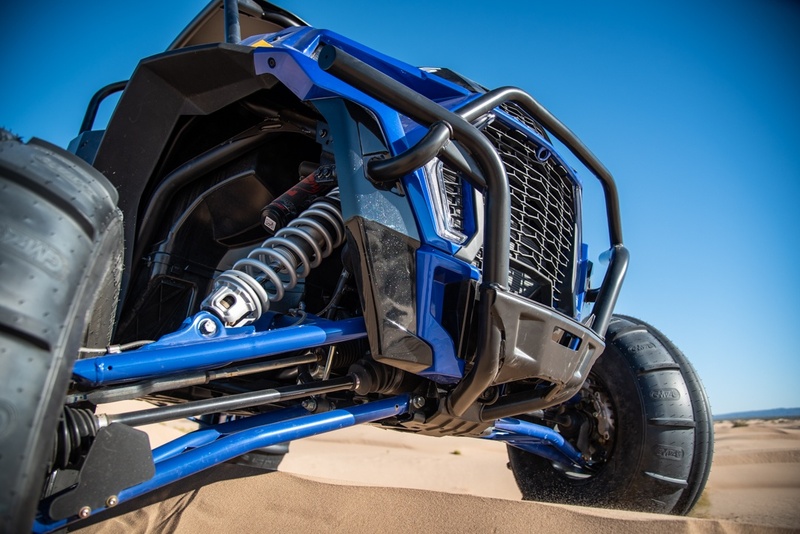 ), a little more horsepower, and better suspension performance through long whooped out sections, then the Maverick X3 is going to be your vehicle. The X3 feels like a slot car driving it with a high-slung race feel, whereas the RZR can be cruised easier but it absolutely comes alive when driven hard. Again, all personal preference here. If I could sum up the RZR XP Turbo S compared to previous generations of the RZR, it would have to be: refined. The Turbo S is refined beyond all previous RZR generations. It’s built better, feels more confident behind the wheel, is more comfortable for long rides (both in the suspension department and when we are referencing the interior), and it just is a blast to drive. All. Darn. Day. If you can afford the $28,199 MSRP US, then we can imagine you’ll be happy with this 72” wide machine for many years to come. Now, get out there and ride! Be safe on the trails, everyone.